This year has been a positive one for salmon, especially sockeye salmon. By mid-August, the run of sockeye up the Columbia River was the highest since Bonneville Dam was completed in 1938 and annual counting began. The run of spring Chinook returning to the Columbia was strong as well, adding to a pattern that may bode well for the future. According to biologists, favorable ocean conditions, habitat restoration, updated hatchery practices, and fish-friendly improvements to dams have all helped. The resurgence of Snake River sockeye, an endangered species, is especially heartening. The Council, Idaho state, Shoshone-Bannock Tribe, NOAA Fisheries, Bonneville Power Administration, and others have been working for 20 years to rebuild the sockeye population. Only four years ago, when just three fish made the 900-mile trek from ocean to spawn in the mountain lakes of central Idaho, the Council's Independent Scientific Review Panel recommended ending the sockeye program. But the Council, Bonneville, and others stuck with the fish, backing the hatchery program. This year, 1,400 or more are estimated to spawn in Redfish Lake in central Idaho, which will be the most since 1956. And the news for fish returning to the upper Columbia River is also encouraging, with one qualification. The run splits, with fish returning to the Wenatchee River and Lake Wenatchee and fish returning to the Okanogan River and its headwater lakes in British Columbia. As many as 90 percent of returning sockeye are Okanogan fish. The reason for the discrepancy is unclear, but the Wenatchee run was one of only two Northwest sockeye runs to do poorly this year; the other was Lake Washington. 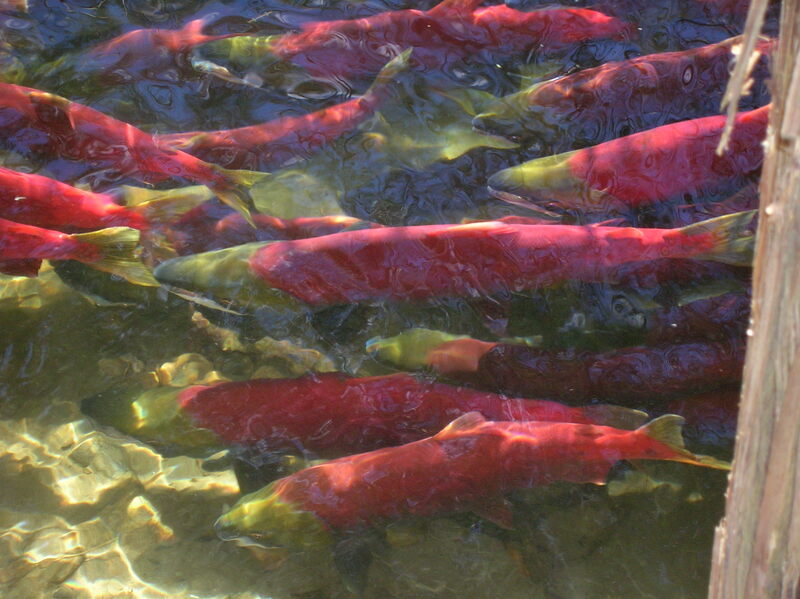 Still, in British Columbia, the estimated sockeye return of 120,000 to 140,000 is one of the largest since 1938. Bill Tweit, Columbia River policy lead for the Washington Department of Fish and Wildlife, noted that three mid-Columbia public utility districts--Douglas, Chelan, and Grant--have adopted performance measures for fish survival through their dams. A combination of spill and the construction of passage facilities have made a difference. "Even though they have not uniformly achieved the measures, they have made significant progress," says Tweit. "Undoubtedly, those improvements played a role in these excellent returns."